Did you take a look at the Oslo Pass and freak out at the cost? It's OK: Oslo is blessed with some fantastic free sights. Vigeland Sculpture Park is full of beautiful art. Photo by donquijote82. 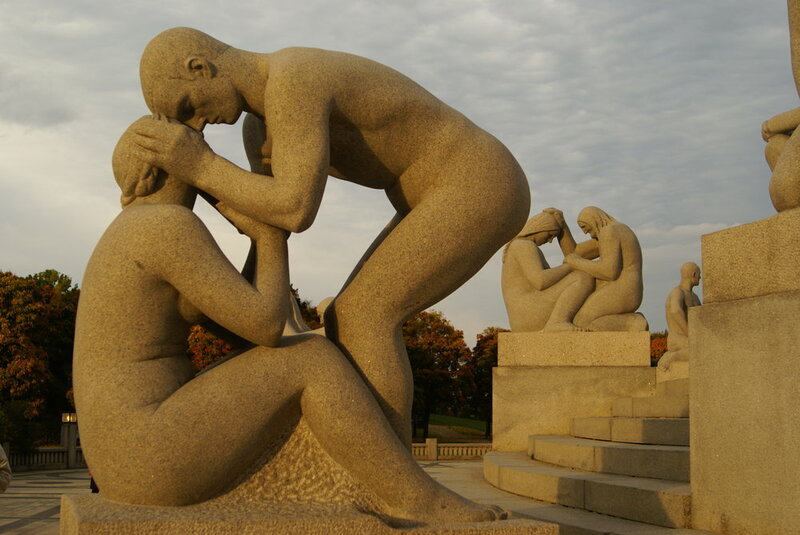 Possibly the most popular attraction in Oslo, the Vigeland Sculpture Park in Frognerparken is home to one man's legacy. That man, Gustav Vigeland, was a prolific sculptor and the park houses over 200 sculptures based on his designs made from bronze, granite and wrought iron. Highlights include the Monolith, the Wheel of Life and the Angry Boy. Location: Frognerparken. Enter through the Main Gate on Kirkeveien. It's about a 20 minute walk from the Royal Palace. The architectural icon of modern Oslo, the Opera house was the first step in the revitalisation of the Oslo waterfront. Take a stroll over the Carrara marble roof (yes you can walk on the roof) and soak up the views of the Oslo fjord. It's beautiful inside as well, the curved walls lined with oak. Naturally, there's free Wi-Fi and a nice free toilet too. Outside at ground level, make sure to take a trip towards the back to get a glimpse of preparations for the next show through the massive windows. Dating back more than 700 years, the Akershus fortress sits at the southern edge of the city centre overlooking the Oslo fjord. The fortress is fun to explore and a lovely place to enjoy a picnic in the warmer months. If you're so inclined you can drop into the Visitor's Centre and pick up a "Fortress Trail" map which will guide you around various points within the grounds. Opening hours: The main gates are open from 6am-9pm everyday. Enter from Kirkegata. 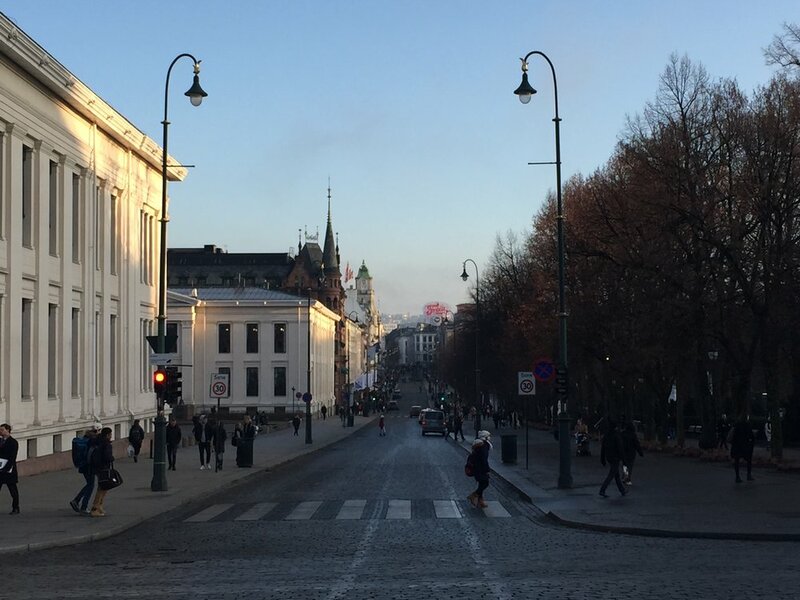 Across from central train station at Jernbanetorget, begins Oslo's main street, the pedestrianised Karl Johans gate. Do some window shopping along the way as you head past the underwhelming Oslo Cathedral towards Stortinget (parliament). On Saturdays you can take a free 1-hour tour at either 10am and 11.30am. Enter from the rear entrance in Akersgata. From Stortinget, keep going towards the National Theatre, and finish at the Royal Palace in Slottsparken. If your timing is impeccable, you'll catch the fairly casual changing of the guard (hint: everyday at 1.30pm). Head first to the Oslo City Hall, where you can wander in and see where the Nobel Peace Prize is awarded every December. From there, take a walk past the Nobel Peace Center and along the waterfront at Aker Brygge and Tjuvholmen. Both areas have a history connected with shipping and have been redeveloped relatively recently. See how the wealthy folk of Oslo live in their fancy apartments with fjord views. This is purely a look but don't sit activity as restaurant prices in this area are outrageously high. Grab a coffee from Kaffebrenneriet or visit the Joker supermarket if your blood sugar drops. Location: Begin at Oslo City Hall. If you're in town on a Thursday, make the most of the free admission at the National Gallery (normally 100 NOK ). The collection features pieces from Norwegian and international artists. You'll find a selection of Edvard Munch's work including versions of The Scream and Madonna. Location: Universitets gate 13, Central Oslo. A 30 minute walk south-east of the city centre will bring you to Ekerbergparken. Here you'll find another sculpture park featuring works from Dali, Rodin, Botero, Hirst, and of course Vigeland. See if you can find all 35 pieces. Fantastic views of the city and the fjord can be had and there are large green spaces for picnics and relaxing. Beautiful wooden houses line these small streets just west of Mathallen. Along Telthusbakken you will also find Oslo's most central allotment garden. At the top of the hill lies Gamle Aker church. Dating back to the 12th century it is the oldest surviving building in Oslo. A little further south, you'll find the short but sweet street called Damstredet. The Aker river splits Oslo down the middle and offers a lovely setting for a walk. From north to south you will find the newly-developed Nydalen, residential Bjølsen and Sagene, fashionable Grünerløkka and good-value Grønland. If you follow the river north it will be uphill, so - and here is where you will yell at me and tell me it's not actually free - you might want to spring for the number 54 bus up to the Frysja stop and start there. If you take it easy the walk itself will be around 2 hours, but there's plenty to stop and see on the way, whether you want to pick up a hot dog, a cup of coffee or just sit and enjoy nature. Opening hours: 24 hours, with a warning: Some parts are not well lit and can be dodgy at night, so I recommend walking along the river after dark. Location: Begin at the Grønland metro stop for a short walk north into Grünerløkka, or ideally begin at Frysja bus stop in northern Oslo for a long walk south.